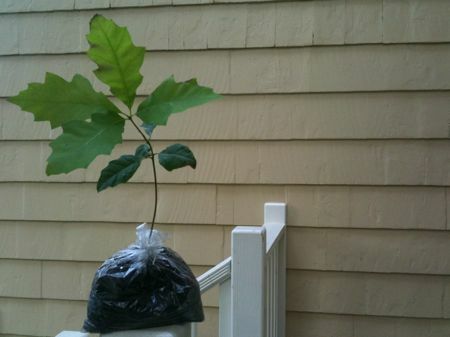 In April, digging around in the yard, I slipped a sprouted acorn out of the ground, put it in a plastic sandwich bag with some damp soil and mulch, and sealed it with a twist. My intention was to mail it to a friend’s child, as a surprise. I forgot. And yet it has been doing well on its own, sitting on the shelf attached to the gas grill, waiting for me to make up my mind what I’ll do with it, and growing.